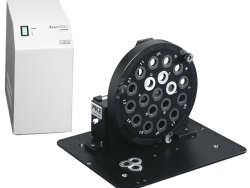 The AutoDiff is a high performance, automated diffuse reflectance accessory developed to analyze multiple samples with minimal user intervention. 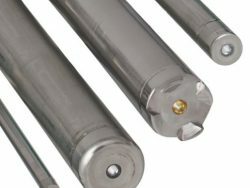 Typical applications include powdered pharmaceutical samples, high throughput forensic sampling, kidney stone analysis, soils and analysis of many other powdered samples where speed and efficiency are important. The design employs an automated R-theta sampling stage with positions for up to 60 samples, providing diffuse reflectance analysis with greatly reduced operator intervention and increased sample throughput. 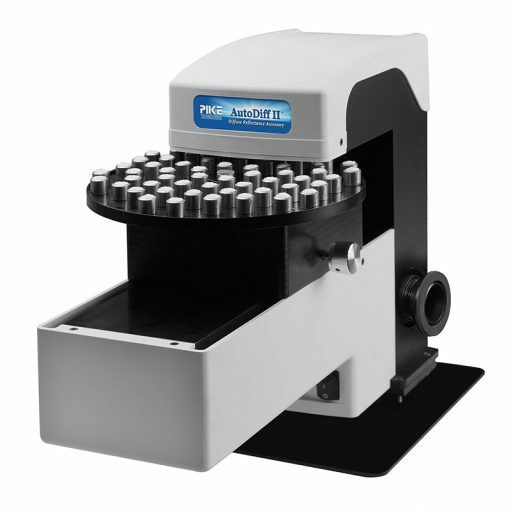 The AutoDiff is a high performance, automated diffuse reflectance accessory developed to analyze multiple samples with minimal user intervention. 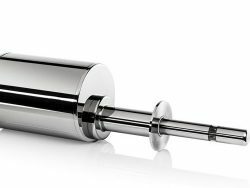 Typical applications include powdered pharmaceutical samples, high throughput forensic sampling, kidney stone analysis, soils analysis and analysis of many other powdered samples where speed and efficiency are important. The design employs an automated R-theta sampling stage with positions for up to 60 samples, providing diffuse reflectance analysis with greatly reduced operator intervention and increased sample throughput. The optical design of the AutoDiff utilizes a high efficiency fixed ellipsoidal reflector to collect the maximum amount of diffusely reflected energy from the sample. Other optical components important to achieving this high performance are aligned and permanently located. 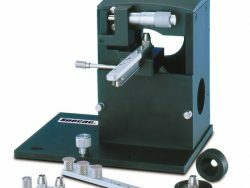 The accessory is baseplate mounted in the FTIR spectrometer sample compartment and can be purged independently or it can use the spectrometer’s purge. Spectral quality and reproducibility are excellent with the AutoDiff. By programming the collection of spectra at precise time periods and alternating sample and background collection, any effects of atmosphere are greatly reduced. 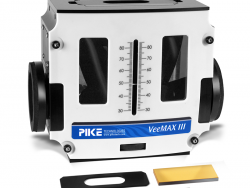 The PIKE AutoDiff fully automates diffuse reflectance FTIR spectroscopy. The sample holder contains positions for sixty samples, plus a center position for a background sample, which usually consists of pure KBr powder. The sample plate is marked into six areas, labeled from A to F. Each area has ten sample positions marked from 1 through 10. This sample position numbering scheme is also used within the software for describing and positioning the samples. 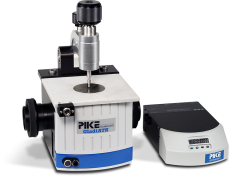 The AutoDiff is controlled by PIKE AutoPRO software which incorporates multi-operator sample submission. The system is extremely flexible and the graphical user interface is intuitive and simple. Multiple operators may independently log samples onto the system. The AutoPRO software integrates easily with most commercially available FTIR software packages. 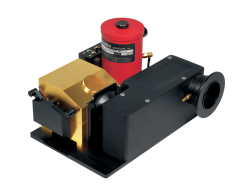 The AutoDiff is also available with gold-coated optics for highest performance mid-IR analysis and for automated NIR diffuse reflectance sampling. 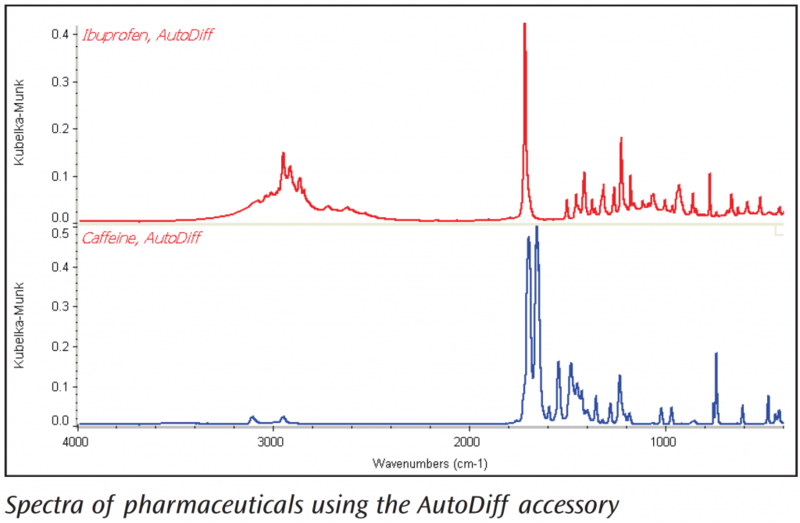 AutoDiff – Automated Diffuse Reflectance Sampling Spectra of pharmaceuticals using the AutoDiff accessory.